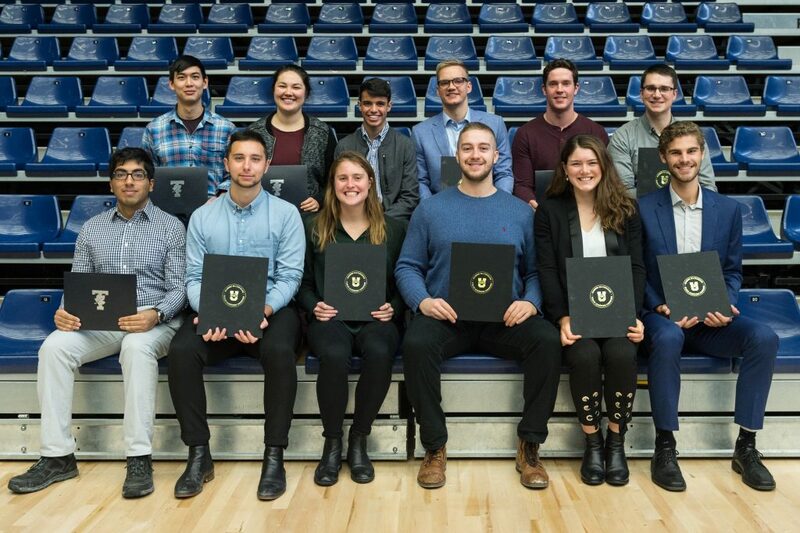 U of T Engineering student-athletes at the 2019 Academic Excellence Breakfast. Top row (L-R): Matthew Chen (MSE 1T7 + PEY, MSE MASc candidate), Megan Kamachi (IBBME MASc candidate), Zach Frangos (Year 2 ChemE), Osvald Nitski (Year 3 MechE), Tanner Young-Schultz (CompE 1T8 + PEY, ECE MASc candidate), Jacob Weber (Year 3 EngSci). Bottom row (L-R): Kamran Ramji (Year 3 EngSci), Stefan Dusciuc (Year 3 IndE), Nicole Parkes (ChemE 1T8 + PEY), Matthew Freibauer (MechE 1T8 + PEY), Somerset Jarvis (Year 3 CivE), Jack Berkshire (Year 3 IndE) (Credit: Seyran Mammdov). U of T’s Varsity Blues celebrated its top student-athletes from the 2017 – 2018 academic year at the ninth annual Academic Excellence Breakfast on Jan. 22, 2019. Matthew Chen (MSE 1T7 + PEY, MSE MASc candidate) is one of the 2017-2018 U of T Engineering Varsity Blues Academic Excellence Award recipients. ← Connecting Legal Education with Science & Engineering!